CSUN alumna Erin Oxhorn-Gilpin is one of California's 2018 Teachers of the Year. Photo by Lee Choo. 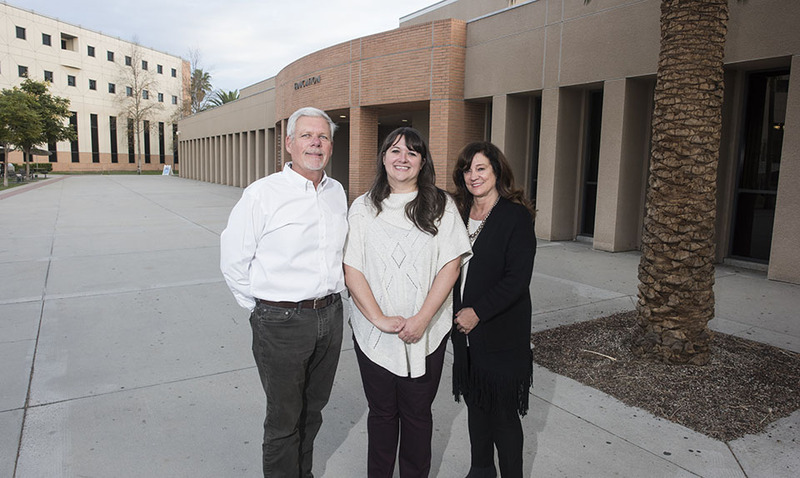 Erin Oxhorn-Gilpin with David Kretschmer, interim chair of the Department of Elementary Education, and Shari Tarver Behring, interim dean of the Michael D. Eisner College of Education. Photo by Lee Choo. “I come from a family of teachers, so I guess you can say it’s in my genes,” she said. Oxhorn-Gilpin ’05 (Liberal Studies/Multiple Subject Teaching Credential) started working with children when she was 14. Today, she’s a first- and second-grade teacher (she teaches a “split class,” where two age groups are combined) at Northlake Hills Elementary School in Castaic, north of Los Angeles. This October, state officials named her as one of California’s 2018 Teachers of the Year. “There are so many great teachers out here who don’t get that recognition. The fact that it happened to me is still kind of surreal,” Oxhorn-Gilpin said. Oxhorn-Gilpin was born and raised in Granada Hills. In 2002, she transferred to California State University, Northridge from Moorpark College and joined the Integrated Teacher Education Program (ITEP), which allowed her to graduate with a bachelor’s degree and teaching credential. ITEP is designed for students who want to pursue a career in elementary education or special education. The program offers subject matter courses leading to a degree in liberal studies, combined with field experience in teaching. Students learn from in-classroom observations and get to apply their teaching skills in a classroom environment. “She’s joining an elite group of five former teachers of the year from our college,” said Shari Tarver-Behring, interim dean of CSUN’s Michael D. Eisner College of Education. To receive the state honor, Oxhorn-Gilpin had to master several stages of a thorough and difficult application process. She was nominated School Teacher of the Year for the 2016-17 school year by her colleague Allison West. After that, she was selected District Teacher of the Year and then Los Angeles County Teacher of the Year. For the next step, the statewide accolade, Oxhorn-Gilpin had to write several essays, and participate in online and in-person interviews. “Erin was thrilled about every step she reached, but also pursued the next level with determination,” said Erin Augusta, principal of Northlake Hills Elementary School. Out of the five teachers nominated for the state honor, Oxhorn-Gilpin is the only elementary school teacher. She loves working with younger students, and she likes to see their achievements and development into stronger readers and writers, Oxhorn-Gilpin said. “It’s a gift that I get to work with children, and watch them grow as a person and academically as a student,” she said. Oxhorn-Gilpin is active beyond teaching, as well. She’s part of her school’s leadership team, representing the second grade. She also works on the district’s curriculum and serves on the school site council — which consists of the principal, a group of teachers and parents, and meets bi-monthly to discuss school issues. She also mentors new teachers who just started their careers in the classroom. Oxhorn-Gilpin credited CSUN for the valuable skills she learned about how to be a better teacher. Oxhorn-Gilpin said she is committed to classroom teaching for the long term. “I love working with kids, so I don’t want to be out of the classroom,” she said. As she teaches her students reading, writing, math, science and social studies, the teacher said she could imagine taking on a specialist position, such as working with struggling students or serving as a reading specialist.